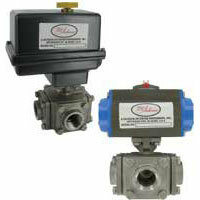 Dwyer pressure switches are explosion-proof, ATEX approved, weatherproof, compact and low cost. 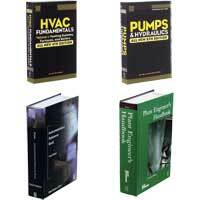 Applications include HVAC applications, process applications, all weather applications, and gas furnaces. 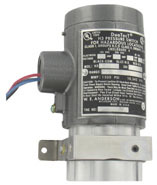 Explosion-proof Differential Pressure Switch applies to HVAC, processes, and all-weather. 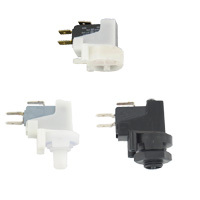 Used with air or compatible gases. Applications with hazardous atmospheres. 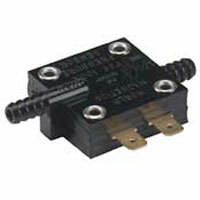 Bourdon Tube Pressure Switches have extremely high sensitivity and great repeatability. 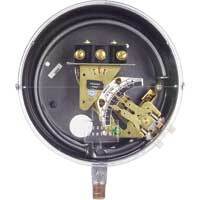 Hermetically sealed mercury switch is available. Applications include compressors and pump control. Explosion-proof Differential Pressure Switch combines the best features of the popular Pressure Switch with the benefit of natural gas compatibility. 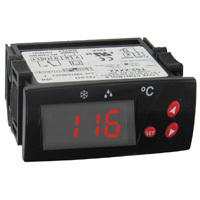 Compact and easy access to the SPDT relay. 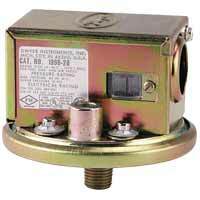 Gas Pressure/Differential Pressure Switch is used with air and other compatible gases. 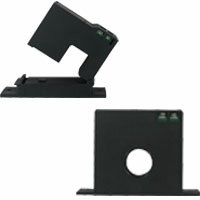 Clear easy-to-read, and convenient external setpoint adjustment. Applications include natural, manufactured or LP gas. 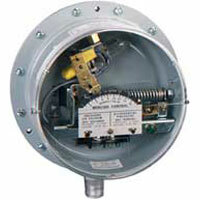 Compact, Low Cost, Range 4 to 20" w.c.
Gas Pressure Switch used with natural, manufactured, or LP gas. 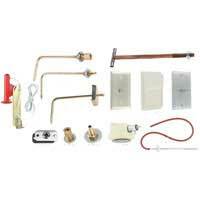 Applications in gas furnaces and natural, manufactured or LP gas applications. Compact and low cost. 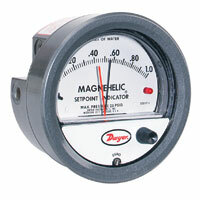 Ideal for high or low gas pressure interlock. 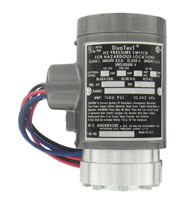 Dual-Action Explosion-Proof Pressure Switches have a design that is weatherproof and can be mounted in any position and is not affected by vibration. ATEX Approved 1910 Differential Pressure Switch combines advanced design and precision construction to make these switches able to perform many of the tasks of larger, costlier units. ATEX Approved ADPS Adjustable Differential Pressure Switch is designed for pressure, vacuum, and differential pressure applications. 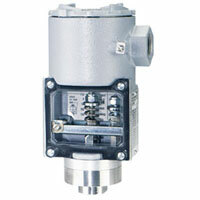 ATEX Approved 1823 Differential Pressure Switch which are ideal for low pressure hazardous area applications. 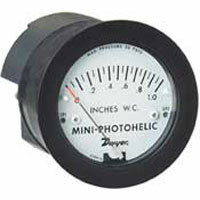 Various housing options such as an overpressure relief valve or external setpoint adjustment knob are available. 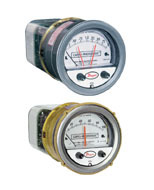 ATEX Approved Photohelic® Switch/Gages with 24 VDC Power combine the functions of a precise, highly repeatable differential pressure switch with a large analog pressure gage. 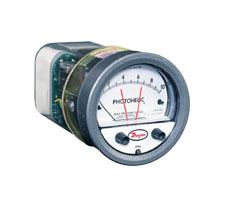 ATEX Approved Photohelic® Switch/Gages with 120, 240 or 24 VAC Power are available in aluminum with glass window, allowing for viewing of set point needles and process pressure. 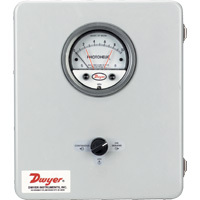 Does Dwyer offer a fully UL/FM/CSA approved explosion proof pressure switch? Yes. The 1950 and 1950G Series. 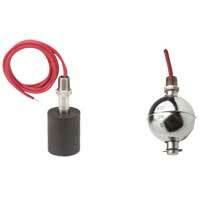 Can the standard H2 pressure switch be used with water? No. The brass or SS housing must be specified for compatibility reasons. The aluminum housing can leak into the switch. I am going to order the d/p switch 1950-5-2-S-AT. Option "-AT" is an aluminum tag. I would like to know the size of the tag. Aluminum tags may contain 2 lines, approximately 9 characters per line.